I gave him a hug, the young 22-year-old who was graduating from college. Arnold (not his real name) had worked for me at the University since he was an 18-year-old freshman. And here he was. Going out into the real world. He told me about his new job in Milwaukee. Blank stare. Followed by a polite smile. Milwaukee’s Fonz statue picture courtesy of daniel.baker, Flickr Creative Commons. What is it with young people today? How can they NOT know who Fonzie is? 1. Da plane, da plane. I say this pretty much anytime I hear or see a low-flying plane. 2. Children of the Corn. Whenever my kids get unruly, I call them Children of the Corn. I think my son believes I’m talking about candy corn. But I’m not. Every time my kids complain I say this. In a whiny voice. 4. The Sanford and Son theme song. Bum bum bana, bum bum bana bana ban, bum bum bana! 5. Calgon, Take me away! “Who’s Calgon?” my son asked. This one is still useful, especially as my oldest heads to middle school next year. So what if he doesn’t know who the heck is Nancy Reagan? 7. He likes it! Hey Mikey! I say this whenever one of my kids tries a new food and likes it. “My name is NOT Mikey,” my daughter has told me indignantly on several occasions. 8. Wouldn’t you like to be a Pepper, too? C’mon sing with me. I’m a Pepper, he’s a Pepper, she’s a Pepper, we’re a Pepper, wouldn’t you like to be a Pepper, too? Be a Pepper, Drink Dr. Pepper! 9. I’m just a bill and I’m sitting here on Capitol Hill. When I get the mail, I sing this. And yes, I fully realize that the bill the song refers to is NOT the same as the electric bill or credit card bill. But I’ll still sing it, thank you very much. 10. Time to Make the Donuts. “What time is it?” my kids ask. “Time to make the donuts!” I reply with glee, laughing at my cleverness. Blank stares followed by eye rolls, folks. Blank stares followed by eye rolls! Now it’s your turn. 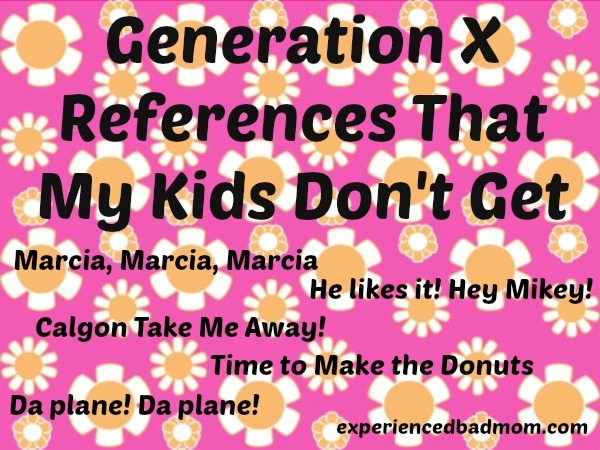 Any Generation X references that you know, love, and your kids don’t get? 70’s wallpaper image courtesy Chris Sharp/Freedigitalphotos.net. This post made me laugh because I remember all of those references. Hahahaha! Of course. I get the blank stares from my 18 and 20 year olds on the majority of my momisms. Love yours. Although I’m (Shame Kelly Shame) drawing blanks on two. Possibly because I’m Canadian? #2 – children of the corn and #9 I’m just a bill and I’m sitting here on Capitol Hill. Kelly!! Awesome job playing along. Just to share, “Children of the Corn” was a low-budget, highly stupid horror flick in the 80s with scary teens who lived in the corn field. I’m not sure I even saw it, but one of the scary teens was named “Malachi” and THAT name I remember! Some parent was cheering for the son, Malachi, on the baseball field the other night and I just couldn’t stop giggling! Love Where’s the beef? I’m going to have to use that one the next time we cook burgers. For me. The kids will look at me blankly of course. How to tell if you’re old…honey, please! But 40 is the new 30. I think. I’m not sure. The memory is starting to go. Oh no, my kid doesn’t know The Fonz either! Now that is a sad realization. Oh you brought back so many old memories! How about “Where’s the Beef?” My kids wouldn’t get any of them either! Michelle @ A Dish of Daily Life recently posted…Sideline Parents, Take it Easy on our Youth Referees! Now when the kids say “What time is it?” I say, “It’s time for lunch!” from teh Bubble Guppies. I am ashamed of myself each and every time! My boys know a few of these! 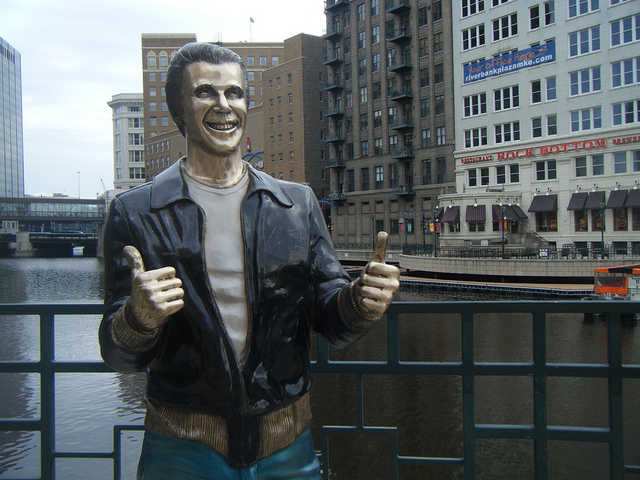 Including Fonzi however even I didn’t know there was a Fonzi statue! 2. Roll up the windows? What, dad? There’s a switch. 2. Roll up the windows – ha ha ha. That’s similar to “dialing” a phone number isn’t it? 3. I’m a Michigan fan so I’m well-versed on the Hardaways! Go Blue! These are hilarious. My seven year old gets the “time to make the donuts” is I say it in a strange Despicable Me type voice. Then again, he’s probably just laughing at the strange voice! Laughed so much! I am so old I can’t even remember all I have said to my kids that they don’t get. I’m racking my brain….Nope, I’ve got nothin’. Thanks for the laughs! This list is awesome. But, at the same time, makes me feel OLD! I swear I don’t even want to know what references my kids won’t get. And what they will be involved in that I won’t get! Thanks for linking up…and for the tip about the linky. Except, no one would ever say that around here. Not a lot of help, you know. This is hilarious! It does make me feel old though. My son would have no idea what any of these meant. But I remember all of them! This is so awesome! I use “Calgon Take Me Away” all of the time! My husband recently brought up an old International Coffee commercial (“I love this coffee. I love that waiter….Jean Luc!) and I laughed so hard. I love those old sayings. Ha! This is awesome! I use so many of these too! Ohhh, “Da plane, da plane”. Classic! I always say “Calgon take me away.” funny thing is, I don’t think I’ve ever purchased Calgon. I have been told many times “my name’s not Willis/Mikey! ” great list. Though I’m so nostalgic, my 4 yo has seen dozens of old Disney movies, and cartoons. Thank you you tube for helping me introduce my kids to my favorite childhood clips! My husband and I quote Seinfeld often. The kids have no idea!! We do too….not that there is anything wrong with that. I was so proud of my son. We were almost done with his homework and in an effort to help him get it done I said, “We are almost there…” and he replied “……take my hand, we’ll make it I swear….ummmmm mmm living on a prayer.” I was so surprised I fell off my chair… laughing.